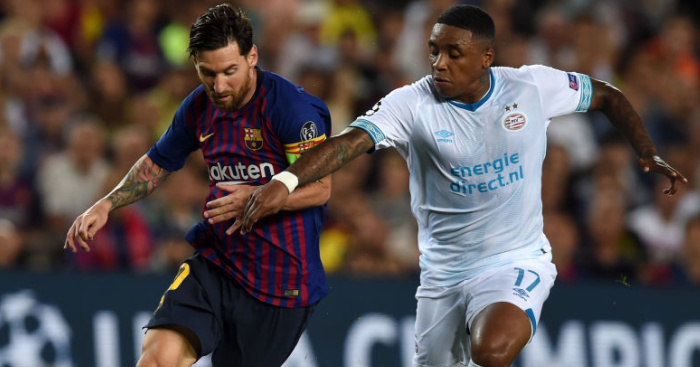 Manchester United are still reportedly pondering a move for PSV attacker Steven Bergwijn, who also remains a target for Liverpool. The 21-year-old winger has had a strong first half of the season in the Dutch Eredivisie, with De Telegraaf claiming that the Red Devils are still keeping tabs on the player’s progress. The report goes on to state that several top clubs are also tracking PSV’s Mexican forward Hirving Lozano, while Holland international Bergwijn has previously been linked with both United and Liverpool for a fee of around £25million. Despite hinting that United are unlikely to make any January additions, caretaker boss Ole Gunnar Solskjaer is said to be looking at potential January signings – with a new wide player and a central defender remaining the club’s biggest needs. By the same token, Liverpool are looking for rotation options behind their prolific front three of Mo Salah, Sadio Mane and Roberto Firmino – keeping Jurgen Klopp on the look out for any potential bargains. Bergwijn, who has scored 18 goals in 78 league appearances for PSV, has the versatility to play on either wing, something that would appeal to both Solskjaer and Klopp. The post Man Utd maintain strong interest in beating Liverpool to £25m winger appeared first on teamtalk.com.